I did some runs, and was hable to fire plasmas at range < 1.0 without any problems in SFC CE. What race and ship are you using when it crashes? I believe it was Fed (against Rom) and ISC against some nameless bandit of some sort. I don't know the version but considering I just purchased it from this site a few days ago, I would imagine it has the latest patch. I will see if I can find the ver number tonight. And I have to admit that my sample size is only 2 and that I am only playing the CE single player campaigns. I have not fooled around with Skirmish or Dynaverse (what's a Dynaverse? Can I have one? ), although, if I recall, one of the tutorials similarly crashed. I have not really had a trouble shooters eye towards this so it is rather anecdotal at this point. i will try to be more attentive and let you know here what I see. If you are just playing the campaigns then probably its that mission TarMinyatur talked about, that is bugged. You can fix that by installing this patch we created this year, that fix the single player campaings. Apart from that, yes that are some times where the game will randomly crash. But overall its ok.
Well, I cannot find a version number nor can a find a save game option. Where would you find those? version 2.6.6.0 and nevermind about the save game button. It just didn't slap me upside the head the first time. I will update via the link sent and see if that takes care of it. Thanks again! Hello, just found this forum recently after I found my old copy of SFC 3 and decided to install it again. I'm playing on a Win 10 machine with screen resolution 1360x768. I downloaded the .dll fix from JanB and it got the game running and seems good to go. My question is, since it runs in windowed mode, is there any way to center the window it runs in? The game loads normally and when I get into an actual mission the bottom of the screen is cut off. As in I can't see the speed indicator or access the bottom buttons in the damage control/shield display. I tried adjusting the resolution on my monitor and moving the windows taskbar over to the right but it doesn't seem to make any difference. Has anyone else had this issue? It's nice to get the game going but sort of a bummer when about 1/8 of the screen is cut off. I tried adjusting the resolution on my monitor and moving the windows taskbar over to the right but it doesn't seem to make any difference. Has anyone else had this issue? It's nice to get the game going but sort of a bummer when about 1/8 of the screen is cut off. Give a try on the HD patch that was made for SFC3. 4. Open your SFC.INI file, and make sure "resmode=0"
I was been tormented by the lack of perfomance of the SFC games in Windows 10. I recently upgraded my computer to a much faster machine, and while the game runs smoothly without any problems or compatibility modes, the game in full HD was running in a painful ~10 fps (full screen). I really hated the idea of running in window mode + software mode, just to extract some aditional fps, while in the process was cutting some visual quality. Why i didn't tested this before? But my fps jumped to a stable 60 Fps in windows mode with hardware acceleration enabled !? So i had to share it with who don't know it already. I also recommend that you read these excellent tips from FireSoul on how to take advantage of modern hardware. That is great, Carlos. 60fps ought to cut the mustard. 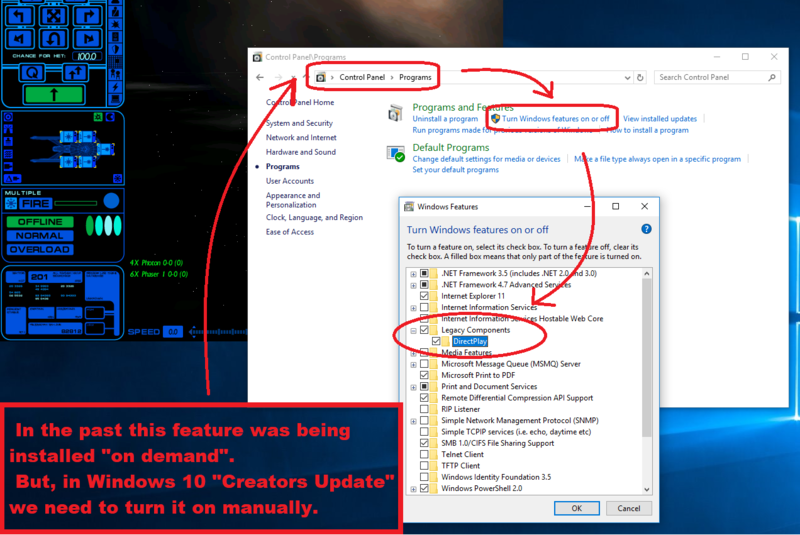 fixed my issues - maybe if ya'll do another patch think about doing a OS check an incorporate for windows 10? Reproduced from THIS thread, but pertinent for Win10 compatibility, at least for Orion Pirates! Okay BIG successes to report I think! My laptop runs Win10 x86, with native desktop at 1920x1080 resolution. Installing off the OP CD led to only seeing the graphic with the INSTALL button, which, when clicked, would cause the window to disappear showing the desktop but no install. Using ISO had the same result. Trying to copy files from the ISO to a folder on the laptop gave me the .cab files off the disk, but I was unable to expand them. So, went to a different XP machine and installed OP from the CD, but chose a folder path to emulate what I wanted on my Win10 laptop: ( C:\User\[My name]\Documents\my games ). Incidental note: I did NOT install Gamespy Arcade stuff. This created the default folder substructure but in my Documents folder, ie C:\User\[My name]\Documents\my games\Taldren Software Inc\Starfleet Command Orion Pirates . I copied that entire folder, folder tree and all (including appropriate subfolders), to a USB drive from the XP PC. "Directory"="C:\\Users\\[My name]\\Documents\\my games\\Taldren Software Inc.\\Starfleet Command Orion Pirates", which I selected, and in "File" menu, selected "Export" to save it as file "Starfleet Command Orion Pirates.reg". I copied THAT reg file onto the USB drive as well as the intact extracted folder tree from the SFC OP install. I ejected the USB drive and brought it to the laptop. I copied the "Users\[My name]\Documents\my games\Taldren Software Inc\Starfleet Command Orion Pirates" folder from the USB onto my laptop's C: drive, leaving the entire subfolder structure INTACT. I copied the Starfleet Command Orion Pirates.reg file from USB onto my desktop. Double-clicked on it and OKAYED the installation of the entry into my registry of the Win10 laptop. But I kept on. 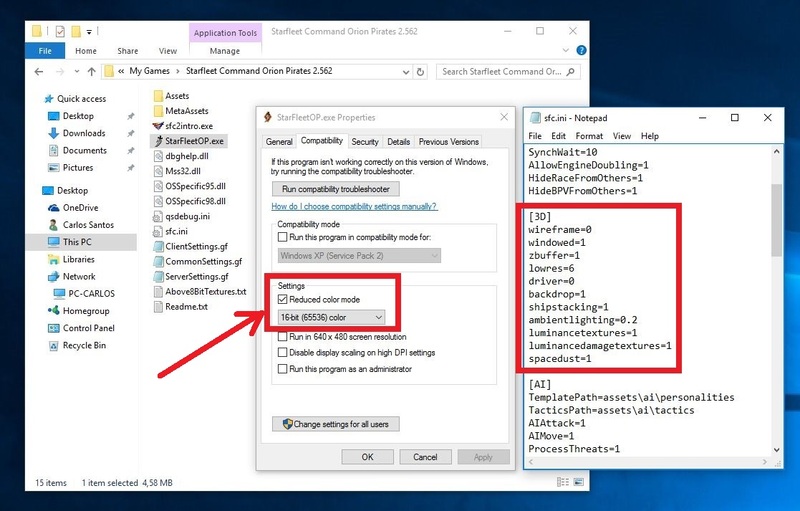 I moved the downloaded and unzipped SFCOP 2500-2562.exe patch to the Starfleet Command Orion Pirates folder, ran it, and directed the patch upon the prompt to the proper directory. i then ran StarFleetOP.exe one again. This time, I got an upper left corner black window on the desktop, and nothing else. No sound, images, or anything. I closed the process with Task Manager. I THEN performed the 60fps adjustments to StarfleetOP.exe Properties>Compatibility Tab>Settings, ticked the Reduced Color box & set the pulldow bar to 16-bit color. ...OMG it works! I ran the same first tutorial, and kept it running for 10-15minutes without crash. I still have to install firesoul OP4+. Carlos, you using firesoul OP4+ with or without models? And PAGING CAPTAIN ADAM! I need to get the improved space textures PLEASE! I'm psyched that I THINK this got it working! Excuse length of post, but I wanted to share, and hopefully get others going in the right direction. Thanks, Carlos!!!! PS - Not joking about Captain Adam. I NEEDS those textures!!!!! I tried this (as well as installing the 2563 patch), and it still isn't working. You don't need any of that. Just go to your SFC game's directory (whether it's SFC 1, SFC 2 EAW, SFC 2 CE or SFC OP), open sfc.ini with Notepad, find the "async=1" entry and change it to "async=0". Early game crashing fixed. It's already set at 0. I had some problems recently, after updating my desktop to a fresh Windows 10 "Creators Update" installation. There is a way to solve it!